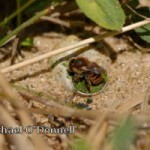 There are 77 different species of solitary bee in Ireland. Identifying solitary bees to species level generally involves taking a specimen and using a stereo-microscope along with a specialist key. However, there are a small number of species below that can be identified in the field by sight. If you spot any of these species please submit your record to help us improve our knowledge of their distribution. It is a spring species and will generally be seen between March- June. The earliest it has been recorded in Ireland is 22nd March (2011). In the UK, A. cineraria has been increasing in abundance and is common in urban environments (parks, gardens, orchards). This is not yet the case in Ireland. If you think you’ve spotted this species please send a photograph for validation. 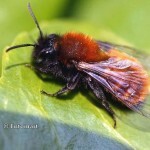 The females are black, with a ginger thorax, orange hind legs, and distinctive red hairs at the tip of the abdomen (there are other Andrena species that look similar but none with a red tipped abdomen). Note that both the hind leg and the hairs on it are orange. Females shave hairs off plant stems (such as Yarrow or Great Mullein) to use in the construction of brood cells. 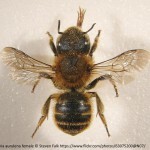 Hairs are brought to the nest site in a ball and teased out with the mandibles, earning it the common name of ‘Wool-carder Bee’. In Britain it is found in various flower-rich habitats, including parks and gardens. Females with orange/brown legs and antennae. Can have two yellow spots on the thorax. In females the abdomen is black and yellow only. 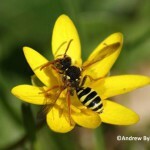 The only similar sized black and yellow species is N. marshamella. In N. goodeniana the second yellow band is entire (not broken in the centre) where as in N. marshamella it is broken. 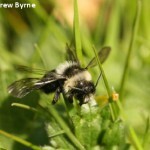 Not commonly recorded, so habitat associations in Ireland unclear. In females the abdomen is black and yellow only. The only similar sized black and yellow species is N. goodeniana. In N. goodeniana the second yellow band is entire (not broken in the centre) where as in N. marshamella it is broken. Females have ginger hairs on the thorax, and ginger/red hair bands on the abdomen which are most obvious towards the tip. The bottom of the abdomen is rounded giving the bee a chunky appearance. Restricted to sand dunes and only occurs down the east and south east coasts. 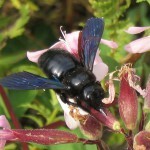 Distinctive entirely black bee with dark wings (not unlike a massive bluebottle fly). 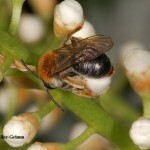 Very big species, one of the largest solitary bees in Europe. Recorded in Waterford City in 2007 but hasn’t been seen since. It started over-wintering in Britain in 2007 and is likely to be a new addition to our bee fauna as a result of climate change. Females with a ginger thorax and prominent bands of white hair on the abdomen. Medium sized solitary species (10-13mm). Late species, can be seen from June-September. Strongly associated with bog, heath and heathy woodland. Reliant on pollen from heathers (Calluna and Erica). 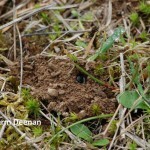 Nests in the ground, often in a south-facing bare or sparsely vegetated bank. Often nests in huge aggregations of hundreds of nests within a small area. Colletes succinctus nesting aggregations will be a hive of activity in sunny days in late summer and are difficult to confuse with anything else. 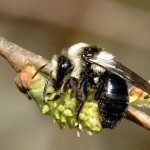 Colletes species have characteristic prominent bands of white hair on the abdomen. The other three Irish species are all restricted to coastal sites. 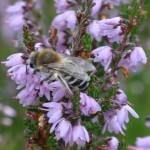 BWARS information on Colletes succinctus. Females with a very distinctive sharply pointed abdomen. The pointed abdomen means it is unlikely you’ll confuse Coelioxys females with any other species. It is impossible to tell the two species apart in the field. Both are rare but C. elongata is larger (10-15mm) and is the more commonly recorded of the two species. C. inermis is 9-14mm. Coelioxys is a genus of cuckoo bees that parasitises the nests of Megachile species. Found in a range of habitats, but in Ireland most often recorded from coastal sites with healthy Megachile maritima populations. It is necessary to take a specimen to positively identify to species level. When viewed under a microscope, the abdominal segments have much denser punctuation in C. elongata than in C. inermis. A BWARS visual guide for the identification of British Coelioxys species can be downloaded here. If you spot a Coelioxys species, it is useful to send in a record at the genus level. There are a number of other species that can be identified in the field with care. A guide on these species can be downloaded here. It currently contains two species, but more will be added in future as time allows. 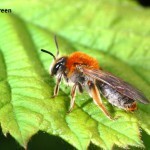 There are also four simple guides to solitary bees which can be downloaded here. These provide an introduction to the taxonomic group for beginners.